“Learning by doing” is the foundation of the Montessori approach to learning. Our pre-kindergarten class is indeed a child’s world, geared to the size, pace and interests of boys and girls between the ages of three and five. Sounds and movements abound in the class as children actively explore, manipulate and investigate in order to see, hear and feel and personally know his/her world. Although individualized instruction is emphasized in the Belleair Montessori Academy’s classroom, group collaboration and cooperative learning are also encouraged and children often engage in small group work. A well established fact is that pre-school children mature at very different rates and their periods of readiness for academic subjects vary a great deal. Knowing this, Maria Montessori believed that learning experiences should not be tedious, but should occur naturally and joyfully at the proper moment for each individual child. The Montessori approach to education teaches children to think, to ask probing questions and to seek creative answers. Our pre-kindergarten classroom is like a learning laboratory, organized into several curriculum areas, among them: language arts, mathematics, everyday living skills, sensory awareness exercises and culture (geography, science, social studies, art, and music/movement). Simpler tasks are mastered before complex ones are introduced. Many materials involve the child is tasks that facilitate eye-hand coordination and small muscle control. Throughout the curriculum, one finds a web of indirect preparations that enhance the learning process. For example, our simple, everyday living exercises have complex aims: to develop order, concentration and independence. 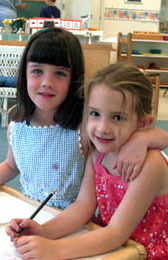 Carefully designed activities allow children to joyfully learn to care for themselves and for their class environment. The tasks of buttoning, transferring quantities and preparing all subconsciously develop accurate eye-hand abilities, which are later needed for reading, writing and other academic pursuits. Children soon develop courtesy, graciousness, poise and self-control, since vital interest in purposeful activity almost always breeds social maturity.